For a variety of cut-to-length, skeletal strip or scrap cutting applications. High performance. Easily adaptable. Precision adjustable tool steel blades. Rapid-Air offers a full range of pneumatic stock cutters that provide outstanding application flexibility and efficiency in handling your routine or specialty shearing and cut-to-length jobs. Choose from a small pivoting arm model for light gauge material up to a cutter that exerts 8,000 pounds of force for 24” wide flat stock.It can be a stand-alone press or base-mounted unit, or part of a fully synchronized cut-to-length system. Whatever your requirements, you canexpect a wider choice of models and options from Rapid-Air - with the kind of operating features, durability and performance that set the industry standards for quality stock cutters and cut-to-length machines. Unique internal single-acting air cylinder design. No external hoses and fittings. Cutters operate on normal shop air. Substantially less air is consumed compared to cutters with double-acting cylinders. Simple blade removal for sharpening. Blades and moving parts are recessed within cutters. Models cover a wide range of scrap cutting or cut-to-length applications. 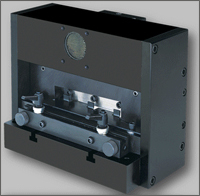 Stand-alone units can be press mounted or mounted on a free-standing base.